Gosh, it’s been a long time since I talked to some of you, so this will serve as a catch-up about my activities as an indie author in 2018. 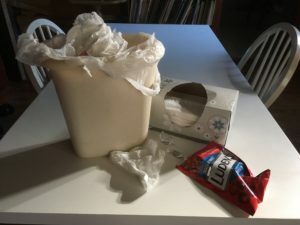 It was very busy for me, partly because I made an ambitious resolution at the start of the year to bring out something new, free or discounted every month. And I did it! Here are highlights of the new stuff. 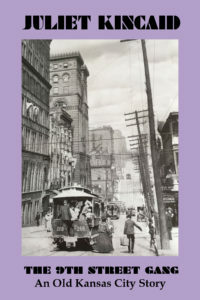 In April, I finished and published a brand new calendar mystery short story called “The 9th Street Gang.” It features Minty Wilcox and Daniel Price pursuing a pesky young gang in Kansas City in February 1900 just after they became engaged in Mischief in March. Click on the cover to buy it for only $0.99. 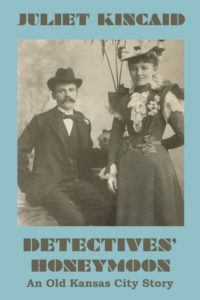 In May, I published another short, “Detectives’ Honeymoon” that picks up exactly where Mischief in March leaves off. It resolves that little cliffhanger at the end of the novel and follows what turns out to be an unusual honeymoon. Click on the cover to buy it for only $0.99. And for those of you Minty and Daniel fans who wondered what happened to the April calendar mystery novel, I drafted it in November as a NaNoWriMo2018 project. I hope to publish it in April 2019. 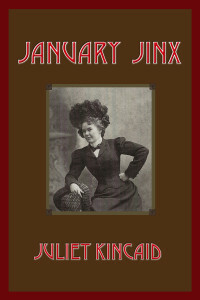 (Note: the digital version of January Jinx, in which my heroine Minty Wilcox confronts all sorts of problems trying to get a suitable job for a woman in old Kansas City, will cost you only $0.99 in the U. S. at www.amazon.com/dp/B00HSSSBE4 or in the UK for £0.99 at www.amazon.co.uk/dp/B00HSSSBE4 from December 27, 2018 to January 3, 2019. It’s also available in print. 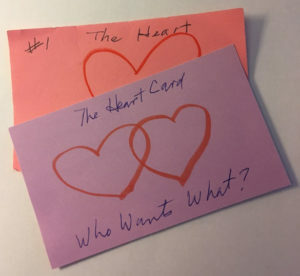 Let Dr. Juliet Kincaid talk you through her unique method of brainstorming a novel with twenty cards in the first part of Novel Basics. Then follow through with her expert guidance on time management, as well as drafting and revising a novel. Altogether, Novel Basics provides a compact yet complete practical guide to writing a novel, whether it’s your first or your fifteenth. In this book, I describe the novel as a tool of infinite possibilities, a sort of Swiss Army knife with a million blades. And I view the book as my legacy for future novelists no matter who you are or where or when you write your novels. 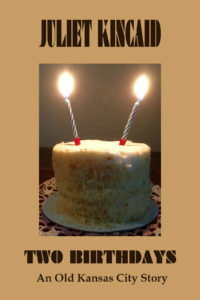 Novel Basics is now available as an eBook at www.amazon.com/dp/B07K2LXFRP for $3.99 and in print (9781730833991) for $8.99. It’s December 1, 2018, shortly before 11, and I’m driving through a light rain on my way to my Sisters in Crime meeting. I’m very excited about it, too, because our speaker today is Julie Mulhern, author of the Country Club Murders and Poppy Fields series, both of which I adore. I pull into the lower parking lot outside the library. Seeing no places in the closest rank, I drive on past the filled places,, turn right at the end of the row, turn right again and right once more into a narrow slot between a black sedan and another vehicle. 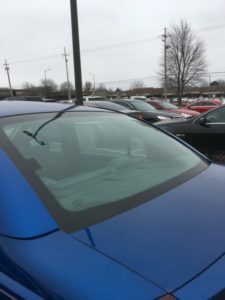 I turn off the windshield wipers and then the car, get out, and lock the door. It’s then I first hear the voice. I look around. There’s nobody in sight in the rainy parking lot. I hear the voice again. I look around again and still don’t see anyone. I hear the voice a third time and this time I make out what the voice is saying and it’s very close. “Ma’am, you hit my car,” a man says. I stoop down and see a shadowy figure behind the wheel of the black sedan. He’s holding a cell phone to his ear. “Ma’am, you hit my car,” he says again. I straighten up and look down at the door of the sedan. I see a white blip, but it rubs off. I rub off another white blip before I lean down and look into the car. “I don’t see any damage.” About then I realize that if this guy really gave a crap, he would have gotten out of the car and looked. “Ma’am, you hit my car,” he growls once more, sitting tight while this old lady still stands out in the rain. Maybe that’s the purpose of the exercise or just to jack me around or to show what a hard a$$ he is to whoever he’s talking to on the phone. Regardless, I say, “I’ll be more careful next time,” and hustle down the hill and into the library. “That’s all right,” Julie says. So we shake hands and then we hug. And soon our meeting begins. Julie has packed her presentation on marketing books with a ton of information and–the churl in the parking lot temporarily forgotten–I take a ton of notes. Yeah, yeah, yeah. Well, let’s see. Why are you taking your time to write about that guy anyway? A few answers . . .
1) It was fun for me to find the humor in the encounter with the churl in the parking lot. It’s a lemonade-from-lemons sort of situation. 2) And I firmly believe in the healing powers of laughter. 3) In life we meet lots of different kinds of people. Some of them are jerks who take every opportunity they get to make other people feel uncomfortable. 4) But we also meet charmers like Julie Mulhern. Her generosity in sharing her time and expertise with us balanced that negative experience out. P. S. Check out Julie Mulhern’s mysteries. You’ll be glad you did. I’m very pleased to announce that I finished my NaNoWriMo2018 project yesterday afternoon, certified it on the website, and printed my certificate. Whoop! Whoop! To celebrate, this morning I’m wearing my NaNoWriMo2018 tee shirt for the first time. Also earlier I let myself linger over coffee and the daily Sudoku puzzle instead of flying into the home office, cranking up the Mac, and begin pounding away at the keys. 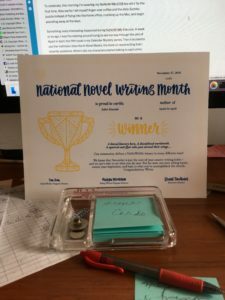 Something really interesting happened during NaNoWriMo this year. A week or so ago, I was floundering around trying to see my way through the plot of Apart in April, the fifth book in my Calendar Mystery series. Then I decided to use the methods I describe in Novel Basics, the book on novel writing that I recently published. When I did, my characters started talking to each other, and I could see them moving through at least one of the settings. Super exciting! Still, I’ve reached a major stage. Now I can relax a little before I have to think much about Christmas-shopping, addressing and mailing cards, decorating the house, partying with friends. Backing up to Halloween, I must confess that I got in a hurry with Novel Basics by publishing the eBook version at eight in the evening on October 31 while my daughter gave out candy to trick-or-treaters, so that on November 1, I could start working on the 50,000 words of my NaNoWriMo whatever-you-want-to-call-it—marathon, sprint write, brainstorm, really rough partial draft. Using Novel Basics reminded me of some things I forgot to put in that book that I tell students whenever I teach the class in person. 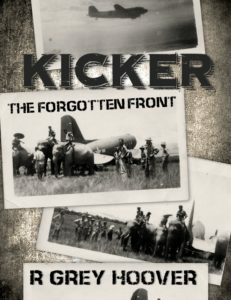 So now I have to revise that book, proofread it, republish the eBook, format the print version, do its cover, and get it out as well ASAP. Oh yeah, and I need to make postcards to give to my friends at a meeting this coming Saturday and . . . See ya! Still, I’ve noticed that working on Apart in April, my NaNoWriMo2018 project, has an analgesic effect on me, so I forget about my aches, pains, and congested nose when I work on it. The writing is going well, and yesterday, I reached the two-thirds mark of the endeavor with 36,293 words, about 3,000 words ahead of schedule. This NaNoWriMo project seems to be going better than my three previous ones. I’ve had the idea for it for quite a while. I even did some brainstorming and research for it in the spring of 2017. Also, this is the fifth book in the series, so I already have many characters and settings that I can use. I don’t need to create them from scratch. The latter factor can be both good and bad. This project is going faster than the others, true, but sometimes knowing so much about the people and places of the book leads me astray. 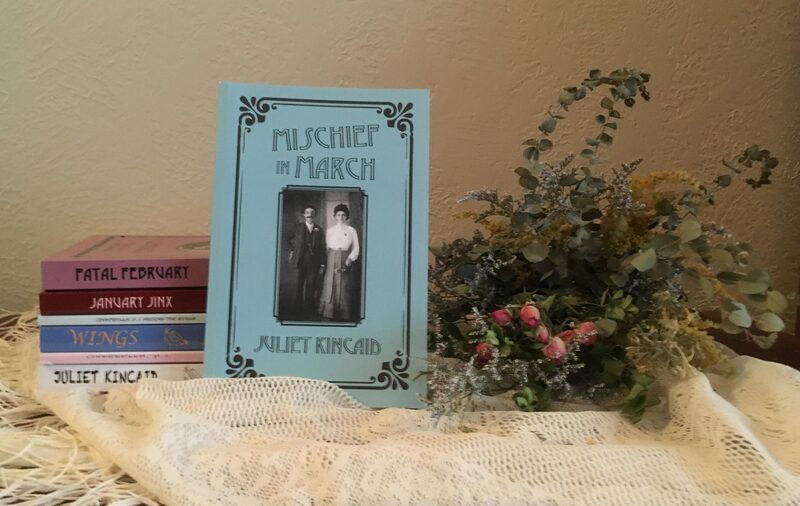 For instance, this past week I got all excited about putting in a scene in which 1) my protagonist, Minty Wilcox Price, has tea with 2) her mother, 3) the woman Minty’s uncle recently married, and 4) Minty’s husband’s aunt. The four women meet in a tearoom recently set up in the house next door to the house where Minty grew up by 5) a woman who appears in Mischief in March and they’re served by 6) the nosy series antagonist who works there. My ump shrugs. “I don’t care,” she says. Yesterday my NaNoWriMo word count reached 23,147, and since I’m trying to add 2,000 words a day, I’ve almost reached midpoint or the Hump Day for Apart in April, the book I’m drafting this month. At this point it seems very chaotic, filled with brainstorms and incomplete scenes, not necessarily in the final order either. Also sometimes I’ve gone back and added notes in red to what I’ve already written. Going back and trying to rewrite while you’re drafting is something others counsel against. For that matter, I do too in Novel Basics, my book on writing the novel. I must admit that I didn’t feel swell when I got up this morning. About six to eight weeks ago I did something to my right shoulder at my exercise class. Don’t nag. I’ve seen somebody about it and even had an MRI. Last night I dutifully took my painkiller and muscle relaxant for it before I went to bed early, so I could get off to a fast start to my workday. But pain in my shoulder woke me up in the middle of the night, probably because I played Spider Solitaire on my iPad mini for an hour yesterday afternoon while I waited for my daughter to come home for supper. It really annoys me when something I do for pleasure turns out to hurt me instead. And my physical frailty makes this whole business of having a career as an indie author at my advanced age seem stupid. Why can’t I just be happy volunteering at the library or a senior center like some of my friends do? So I was gearing up to a rant when an idea popped into my head. What if Daniel is the Watkins Man in this book? And the thought made me laugh. That’s the main reason why I write, you know. It makes me happy. And now I have to get back to it. I can hardly wait to find out what my heroine Minty does when she sees Daniel pretending to be the Watkins Man. 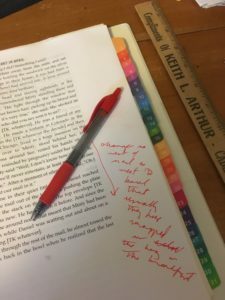 Specifically, once I got started, I found out that Apart in April, Book 5 in my cozy historical mystery series, doesn’t follow the advice I give in Novel Basics, An Illustrated Guide to Writing a Novel. Now back to the cards . . . To my surprise, early in working on Apart in April, I discovered that it has a double heart. That is, it has two answers to the question, “Who wants what?” Daniel wants to find his runaway wife Minty. And Minty wants to solve a case on her own without her husband’s help. What fun! Now I’m off to work on it some more. Have you always wanted to write a novel, but haven’t even known how to start? Or perhaps you’ve written short stories, but the sheer size of the novel scares you off. Maybe you have a novel you drafted twenty years ago tucked away in a drawer or even several first chapters of novels you didn’t complete or a filing cabinet full of drafted novels you could never interest an agent or an editor in. Maybe you started a novel during National Novel Writing Month, but didn’t finish it. Or maybe you did write those 50,000 words and got your NaNoWriMo diploma, but you don’t know what to do with those words. Or perhaps you’re the author of a brilliant, published, and well-received first novel, but you just can’t get your sophomore effort together. Perhaps you’re the author of a best-selling series for which you still have a ton of ideas, but the notion for a new novel has crept into your head and you’d like to explore its potential. Maybe you’ve been working on a nonfiction book about growing up or a shocking event in your hometown and now you think it might work better as a novel. Maybe you don’t fit any of these slots, but still you have an idea, probably sparked by that powerful question “What if?” that just won’t leave you alone. 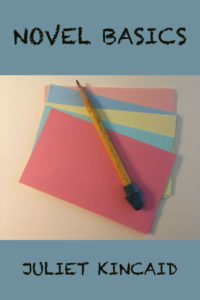 Regardless of which category you might fit into, Dr. Juliet Kincaid’s NOVEL BASICS will guide you through the process of brainstorming a novel fast with twenty index cards. The book also includes practical tips on time management, the process of drafting a novel, and revising a novel as well. As for qualifications, Dr. J, as her students called her, has a plenty of experience with the novel. She has more read than 3,000 of them and counting. 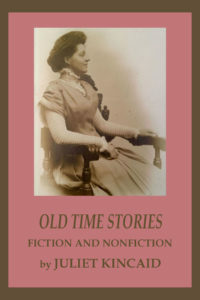 Her dissertation on fiction in diary form was labeled remarkably free of jargon. She’s written more than a dozen novels and she’s published five so far. 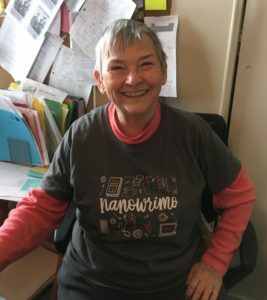 Thirty-five years of experience teaching writing at the college level have honed her communication skills. The book NOVEL BASICS is based in part on Dr. J’s popular workshop of the same name. Here are two testimonials from former students of the course for Juliet’s unusual approach to brainstorming a novel. Novel Basics is the perfect kick start for new novelists to prepare before writing the first line and continuing through the middle to the conclusion. Important story elements are presented in the logical, easy-to-follow order the writer should consider them. Experienced authors can also benefit from this new approach for their next projects. 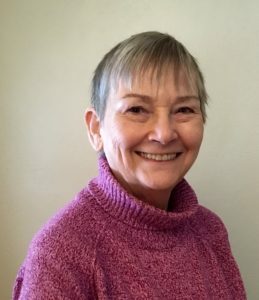 Mary-Lane Kamberg, award-winning professional writer, speaker, and editor and co-leader of the Kansas City Writers Group and founder and director of I Love to Write Camps for young writers. He’s my fiancé, Minty thought. We’re engaged! In just a few weeks time, I’ll be Mrs. Daniel Price. And I’ll be in on that secret married couples keep to themselves. Just thinking about solving that mystery set up a tingling in her lower parts. “Of course, I am, you naughty boy,” she said. 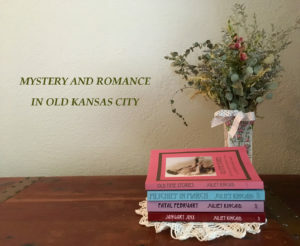 If you wish for something pleasant to get your mind off the lately awful news, delve yourself into the story of three little hoodlums that steal this story from the endearing main characters and enjoy the tidbits of Kansas City history. A bonus is a peek at Jesse James Jr. as I had no idea he existed before reading this story. Good Job! This author always comes through with an enthralling story.